Towards the end of the 19th century Stinchcombe Hill, one of the great natural beauty spots at the southern end of the Cotswolds. The Hill consisted mainly of uncultivated scrub bush controlled only by the south westerly winds which blew across its slopes and the sheep which foraged for what food they could find. Only the southern end of the hill known as The Park was clear and it was here that the people of Dursley gathered from time-to-time for sporting and social events. Despite the rough terrain, it was on Stinchcombe Hill that a small band of enthusiasts led by W. Lloyd Brown and Miss G. Osborne decided to form Stinchcombe Hill Golf Club and the Club was duly constituted on 13th October1889. The course, which was initially nine holes for men and ladies, was laid out by Arthur Hoare, who was to become the Club's first Captain. It was opened for play on Wednesday, 27th November in the same year. The Worcestershire Golf Club from Malvern helped considerably in those early years. William Lewis, the first Professional and Greenkeeper, moved from that club as did Herbert Goldingham, who was the Founder Secretary of the Club and who continued in that post for almost 21 years. Interest in the Club grew rapidly and by the end of the third year membership had doubled from the original 50. It was interesting that there were 52 men whose subs had risen from the initial one guinea to £1-10s-0d, and 48 ladies whose subs remained unchanged at 10s-6d. The original 50 members had helped to finance the club by taking out debentures on which they were paid interest annually and two of which were redeemed by ballot at every AGM. The course, which ran through the scrub, was pretty rough and Green Keepers came and went with great rapidity. An idea of the difficulty of the course, which was lengthened, to 18 holes in October 1906, can be gained from reports in The Gazette and The Field, of horrendous medal scores. CA Gillanders held the Amateur course record at 85 and when international star, Horace Hutchings, playing off a handicap of +6 visited the club just before the turn of the century, he finished up with a net 90. The original clubhouse appears to have been approximately where the Professional's Shop is now, but in 1912, the club purchased the land they own to this day and a new clubhouse was erected with a smart verandah behind the existing putting green. By the time the new clubhouse was available for use, the course was improving and the Medal scores were dropping. In 1912, CA Clark won the Amateur Medal with a gross 78 and according to the Gazette of 21st September, success was achieved with a "Dursley Dart, a first-class ball at a third-class price, which can only be obtained from Pepworth's Sports Outfitters in Dursley. Price 1s-3d each". What this did to Mr Clark's amateur status is not recorded. Matches in the early days were played against The Worcestershire, our old friends Minchinhampton, who were founded in the same year as ourselves, Cheltenham and Bristol & Clifton. Access to the Hill was not easy. The Broadway, which was the steep hill from the town, was only a walkway and the road from Whiteway Hill was often in need of repair. The early Minutes mentioned that the stable accommodation at the club was inadequate and much1ater on, the same Minutes were to record similar problems over inadequate garaging facilities when the horseless carriage became more common. In 1909, the Gloucestershire Golf Union held their first meeting at Stinchcombe Hill. This was appropriate, as AS Winterbotham had in that year become the club's first President of the Union. He was Captain of the Club from 1906 to 1913 and a great benefactor in the years prior to the First World War. He was made a Life Member with his wife in 1921. It was in these pre-war days that the course began to gain a reputation throughout country. Many fine write-ups appeared in the golfing press of the day extolling the virtues of the fine views, the first-class quality of the turf and the layout of the course, which was then 5,500 yards in length. All this came to a halt with the 1914-18 War during which the course could not be properly maintained and started to revert to its original condition. Golf was still played and membership was extended to officers of the Australian Flying Corps stationed at Leighterton during the war years. This was the start of a close association with Australia, later fostered by Sir Percy Lister and Frank Blackstone. A turning point in the club's history was the Annual General Meeting on 2nd January 1919. The war had ended but a considerable sum of money had to be found to restore the course to the condition it had previously enjoyed. Fortunately, the club, under the Chairmanship of Stanley Tubbs, grasped the nettle and set about raising the money required. 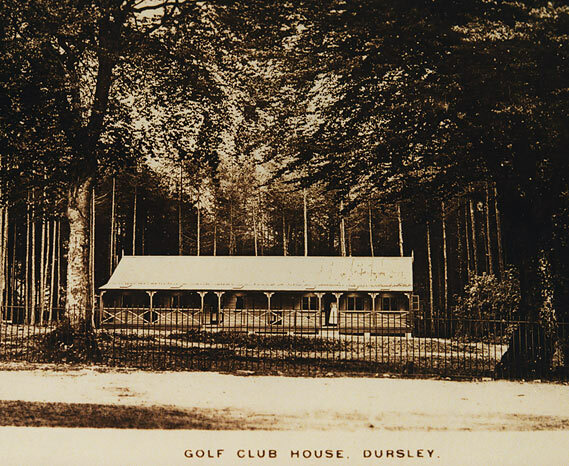 The Dursley Club gave valuable assistance in re-opening the holes including donating the proceeds from a dance which raised the considerable sum (in those days) of £40. By May, nine holes had been re-opened and within 12 months the original 18 holes were back in operation. Not all went smoothly, however, the Caterer wanted to double her wages; the Green Keeper resigned due to pressure of work and the membership in that first post-war year had dropped to 47 men and 23 ladies. It was in this year that George Lister became Honorary Secretary of the club, a post he held for the next 25 years. A single figure golfer for many years, he was honoured by the Gloucestershire Golf Union becoming County President in 1934. Stinchcombe Hill had been bedevilled from the inception of the club by rights of way both actual and reputed. Although in the early days people did not journey to the Hill to partake of its beautiful views and lovely walks as they do today, people from the neighbouring parishes used The Park as their recreation area. David Evans, the well-known local historian, referred us to fairs and sports days being held on the Hill. Cricket was played at The Park and there were also rifle ranges along the ridge, which runs from the 5th to the 8th greens. The Earl of Berkeley and Sir Charles Prevost held manorial rights over the land which was in several ownerships, the largest being the Corey brothers. These ownership problems were resolved in 1929 when Sir Stanley Tubbs, who had been a member of the Golf Club for many years as well as a well-known industrialist and benefactor, acquired the Hill and gave it in Trust. The Golf Club being granted a 99 year lease at a rental of £20 a year exclusive of rates and tithes.The lease gave the members of Stinchcombe Hill and Dursley Golf Club the right to play golf over the Hill and the parishioners of the adjoining parishes the rights of air and recreation so long as they did not impede the playing of golf. The Earl of Berkeley was still given the right to hunt foxes over the Hill. Sir Stanley Tubbs was a tireless worker for the Club in many capacities. In addition to being a fine golfer who represented his county and once reached the semi-finals of the Amateur Championship, he was Club Captain and President and also President of the Gloucestershire Golf Union in 1922. He announced his proposals with regard to the Stinchcombe Hill Trust at the Club's Annual General Meeting on Friday 22nd March, 1929 which also happened to be his birthday. His generosity was well received by the Golf Club and the general public. 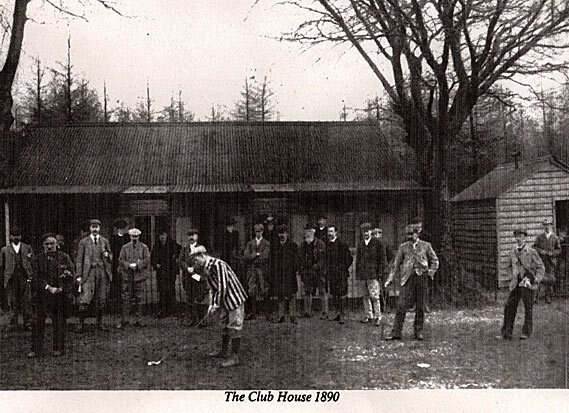 In 1922, the Club embarked on an extensive programme of improvements to the course. Messrs Hawtree and Taylor incorporated a large number of changes including the construction of 80 bunkers. James Braid, the five times Open Champion, came down to play the newly designed course which Hawtree himself had laid out. The new course became renowned throughout the county. 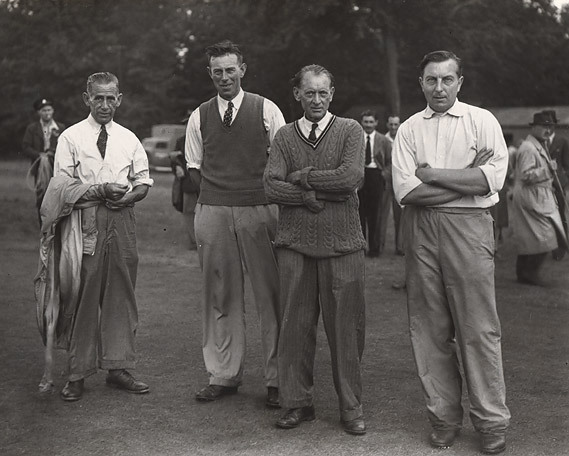 Keen golfers like the Club's President, the Earl of Berkeley, Major March, Colonel AD Murray, Mr. AS Winterbotham and others were still not satisfied with the course and in 1927 appointed Monty Hearn as the Club's Professional. He was also given charge of the course and a few important alterations were put in hand. The sixth green was completely remodelled as was the 15th. Extensive weeding was carried out on all the greens and a water cart purchased to assist with the cultivation. In 1929, James Braid was called in to advise upon further alterations and he suggested a five year programme which included the reconstruction of the 7th, 8th, 9th, 11th and 18th greens. This work was eventually completed in 1936 when an exhibition round was played between Mrs Garron, the English Ladies Champion and international golfer Miss Diana Fishwick, mother of Bruce Critchley the TV commentator. This match received a considerable amount of publicity in the press as had a four ball match a few years earlier, when James Braid and the Club Captain, Colonel AD Murray were beaten with an eagle three on the last hole by J Warne then Gloucestershire's Captain and Club Professional Monty Hearn. Other well known people playing the course were, the Earl of Berkeley who was of course President, Lord Ducie, Lord Westmorland, the Duke of Beaufort, the Earl of Munster, Mr Asquith the Prime Minister and during the time before the abdication Edward, Prince of Wales, later to become Edward the VIII, played many times on the course during his visits to Berkeley Castle sometimes leaving Wallis Simpson at the Castle while he played. Caddies were an everyday part of golf clubs in the thirties and were occasionally difficult to manage. The going rate for a caddie was 2p a round. 1939 was the club's Jubilee Year when Bert Hughes, the one-time editor of The Gazette, produced the Jubilee booklet and the club celebrated 50 interesting and successful years by a Dinner. The celebrations, however, were dampened because the lights were going out all over Europe at the start of the Second World War which was to change golf on the Hill forever. Everyone went off to help King and Country leaving Gilbert Owen to strive manfully to keep up the course despite it being criss-crossed with deep trenches to prevent enemy aircraft landing. Golf was still played, however, with the trenches counting as GUR. Mrs.Parker, the Steward, opened the club and provided teas whenever this was possible. Under the guidance of the Gloucestershire War Agricultural Executive Committee, the club embarked on a disastrous agricultural venture on 15 acres of the Hill. They were instructed to grow a linseed crop, which failed with acrimonious results. Despite the troubles, various companies engaged in war work entered teams who took part in competition for a trophy which was to become the start of the Lister Cup. With the club at a very low ebb, finances strained, the country at war, the clubhouse was destroyed by fire on 11th April, 1944. As usual in times of trouble the Dursley Club rallied round offering their assistance and after much hassle over building controls it was decided to make temporary use of the Professional's shed as a clubhouse. It was in the midst of this gloom and despondency that the club staged one of its prestigious matches on 14th August, 1944, in aid of the Red Cross and St. John's Sportsmans Appeal when Henry Cotton joined with Charlie Picton, Tom Bailey of Minchinhampton and the Stinchcombe Hill Professional, Monty Hearn, in a four-ball match which drew a considerable gallery. Great efforts had been made to get the course in good order for the event and this was to be the start of rehabilitation work after the war. The post war years were very difficult ones for the club with finance at a low ebb including an overdraft of £968. The future appeared difficult. Under the Chairmanship of Sir Percy Lister aided particularly by Sir Fetherstone Godley the Chairman of the British Legion, things gradually got back to normal. For the only time in the Club's history a paid secretary in the person of Lt. Col. RAK Sangster was employed but he left office after only a short while and was replaced by an Honorary Secretary JB Minhinnick and later by Bert Hughes. Despite the committee members standing as guarantors for the bank overdraft, further financial difficulties arose which meant that the staff had to be reduced and Monty Hearn retained in an unpaid capacity. Good financial management overcame these problems and took the Club into the fifties when once again it came into profit. Membership at this time was 134 full members and 35ladies which is still fewer than the number of ladies at inauguration. At about this time Wally Hammond, England's Cricket Captain, regularly played the course, often in the company of Billy Neale another County Cricketer and local farmer. Two unique golfing achievements occurred at the end of the forties, for in 1948 the club was able to boast among its members the English Amateur Champion, Alan Helm, the Gloucestershire County Champion, WSJ Watson who was winning for the third successive year and Mrs Whitley, who had won the Gloucestershire Ladies' Championship for the seventh time. Alan Helm was the son of the Canon of Berkeley. He beat Harley Roberts to win the English Amateur at Little Aston and went on to represent England against France. Stinchcombe Hill also played its part in fostering relations with America and Australia. A match was arranged between Quaker Hill Country Club, New York, when Englishmen staying in America could play for Quaker Hill while Americans in this country were invited to join the Stinchcombe Hill team. In the initial match, despite Sir Percy Lister pairing up with Governor Dewey, who was later defeated for the American Presidency, Arnold Shapland was able to announce that his team had won the trophy that was the Shingle or Tile which hangs to this day in the clubhouse. In a similar vein, Australian golfers were invited to Stinchcombe Hill and Australia Day became a very popular event as it is to this day. One of the most frequent visitors was Graham Virtue who presented the club with several trophies and he was eventually made an Honorary Life Member of the club. Problems in the fifties and sixties tended to revolve around the course which went through a difficult period, and the inadequate Clubhouse which had never been properly rebuilt since the war. 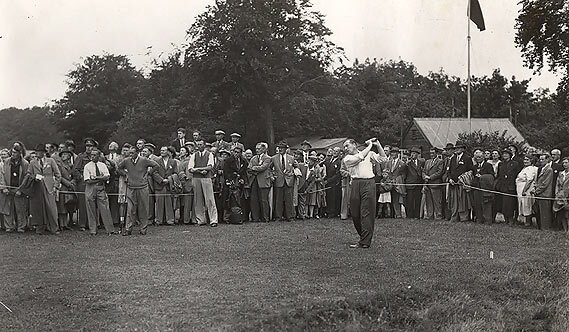 Tom Green the well known professional, who had at one stage led in the Open Championship, was appointed to the Club in 1950 and combined his professional duties with those of Green Keeper. It was at this stage that the 18th green was rebuilt raising it up from its original ground level. Since then the only major change to the course was the construction of the alternative fifth green in 1974, which it was hoped, would help segregate golfers from walkers. A new house was built behind the clubhouse and Tom Green moved into this in 1952 while the Stewards, who came and went with monotonous regularity, occupied a flat in the clubhouse. It was around this time that the Sports Turf Research Institute at Bingley were called in to advise on the problems of the course and with the hardworking green staff and considerable guidance from an enlightened Green Committee led by Jack Smith, the course was eventually restored to its former glory. A question of water on the course was raised following the drought of 1959. Those against it said there was no point in providing water if the greens could survive through those conditions and also warned that watered greens would result in the fine fescues on the course being lost forever. It took the next severe drought in 1976 to get the members to change their minds and a project led by Ken Jones eventually succeeded in getting water laid on to the greens at a cost of some £20,000, paid for in part by a levy on the members and partly by a bank loan. A feature of the sixties and seventies was the encouragement of Juniors at the Club. The subscription for youngsters was kept to a minimum and the Club paid for five lessons. Leslie Hopkins set up the Junior section and later handed over to Bob Griffiths to guide them through the fifties and sixties and it was his most successful pupil and arguably Stinchcombe Hill's finest ever player, Peter French who took over his mantle in1970. One of the Club's most interesting members was John Devon who gave £50 per year during his lifetime so that anyone getting a birdie four down the 18th in a competition could be rewarded with a dozen golf balls. These became known as the 'Devon Dozen'. It was in the period of the late seventies early eighties, which probably showed most change in the club with the long awaited improvements to the clubhouse. In the early seventies, the new Professional's Shop, Secretary's office, entrance hall and ladies and gents changing rooms were built which resulted in Tom Green moving from the flat he occupied behind his shop. By this time, the Stewards, George and Charlotte Balfour, had moved into the club's house in a direct swap with the Professional. The second phase of the improvement was to be the kitchen and dining-room facilities and finally the lounge was completely rebuilt and enlarged to give the club a fine clubhouse it now has and deserves for its centenary. Again, finance was obtained by a levy on the members and overdraft facilities and while the work was in progress, the Dursley Club assisted by kindly offering to share their facilities.